About 10 years ago, the Motorola StarTAC was probably the coolest mobile phone on the market. In terms of size and weight, the StarTAC closely matches modern clamshell phones, and you could consider the StarTAC as perhaps being the first truly modern mobile phone. At the time of its launch, the StarTAC made a huge impact. At roughly half the weight of most competing handsets, and in a much more compact size, the StarTAC made headlines, especially in the business press (for example BusinessWeek and Fortune Magazine). Nobody had ever seen a mobile phone like this before, and it was the first phone that you could easily put in your pocket or clip to a belt and not really notice it. There were several different models of StarTAC handset, covering both analogue and digital phone networks, including CDMA and GSM versions. Original StarTAC models had a small LED display, although this was later changed to a monochrome LCD panel. The original StarTAC phone was fearsomely expensive - shortly after launch the full retail price of the StarTAC (without a contract) was somewhere in the region of $1500 to $2000. For a device weighing just 88 grams or 3.1 ounces, the StarTAC was more expensive to buy (by weight) than pure gold. The StarTAC pictured here is a single-band GSM 900 model, the StarTAC 130 (model MG2-4D11) dating from around 1999. The front of the phone has a quite prominent clip which is the battery cover. Inside, one immediately noticeable feature is that the screen and keypad are all on the lower side of the phone, and the upper half only has the speaker. Compare this with a typical recent clamshell device, and you can immediately see that the StarTAC had a very cramped layout. (Pictured left is the Nokia 6131 alongside the StarTAC). Despite the stylish black design and diminutive size, the StarTAC was not really very advanced. The StarTAC 130 could handle SMS messaging, it had a small number of mono ringtones to choose from and a basic address book. The user interface was truly horrible to use, a problem that dogged Motorola for many years afterwards. There's also an extendable antenna, which is something you never see these days.. unfortunately, this was quite prone to damage. 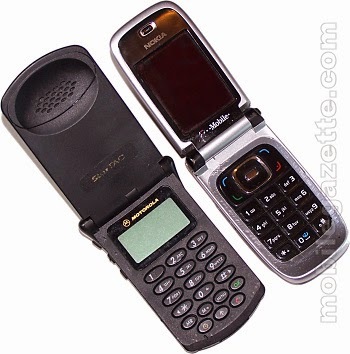 Over the five years or so that the various StarTAC models were in production, very little changed in the way of looks, and Motorola didn't produce anything with this much "wow factor" until the RAZR came out several years later. In 2006, PC World magazine named it the number 6 "greatest gadget" in the past 50 years.. there are even companies such as Retrobrick that sell the StarTAC to collectors today. We have some more pictures of the StarTAC in our gallery.